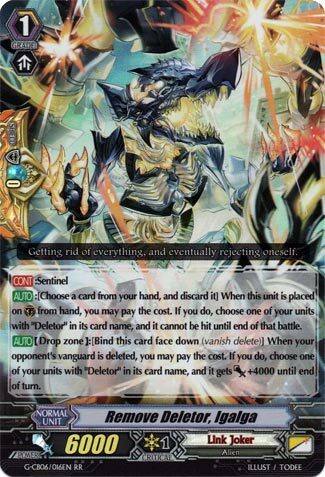 [CONT]:Sentinel [AUTO]:[Choose a card from your hand, and discard it] When this unit is placed on (GC) from hand, you may pay the cost. If you do, choose one of your units with “Deletor” in its card name, and it cannot be hit until end of that battle. [AUTO](Drop Zone):[Bind this card face down (vanish delete)] When your opponent’s vanguard is deleted, you may pay the cost. If you do, choose one of your units with “Deletor” in its card name, and it gets [Power]+4000 until end of turn. Deletor exclusive Perfect Guard. Staple in Deletors and therefore boring to talk about. …well okay sure, make a 16k column 20k to kiss numbers on a Deleted Vanguard. It’s gravy. So why wouldn’t you run this for your main gambit? Use this to make everything big, plus you can call this for your retire effects. Pretty good. What’s up, Rogue Squad?! For today’s Card of the Day, it’s the new perfect guard for the Deletors, Igalga. I’ll admit that at first, I was skeptical about using this over the previous perfect guard, Instill Deletor, Ender, but after experimenting with Igalga, I learned that Igalga is by far the better Sentinel Unit for Deletors for even if you accidentally call this with Zuigge or the new Stand trigger, it’ll still be a good sacrifice as its second skill isn’t drop zone reliant and activated the second it sees the opponent get Deleted, and once that happens, it essentially helps make certain numbers even more of a threat than they already would be against a 0 powered vanguard. Get these, you won’t regret it. Next Time: The value of this one card equals the combined value of all of the other Deletor cards.